These days, it’s common to see most of the costliest and luxurious cars zooming past without much fuss! With the number of millionaires and billionaires mushrooming rapidly from every corner of the world, its isn’t a big thing to drive most coveted brands like Mercedes, Bentley, Bugatti Veyron or the kinds. However pimping the vehicles with gold, diamond and swarovski does help to exhibit your excess wealth on the roads. Bring the traffic to halt with these decked-out editions of ultra-opulent luxurious two and four wheelers. Roll over for the Top 12 blinged vehicles….. cause when you’re rolling down the street, it’s all about the Blings, baby! This good looking hand-built low-rider bike has been inspired from a study of Americal Low-rider culture. The Low-rider bike by Ben Wilson dares to challenge conventional bicycle ergonomics and makes for a super smooth relaxing ride. It also gets dressed with nearly one hundred and ten thousand crystals by guys over at Swarovski. Nearly one hundred and ten thousand crystals have been set in to Ben Wilson Low-rider. 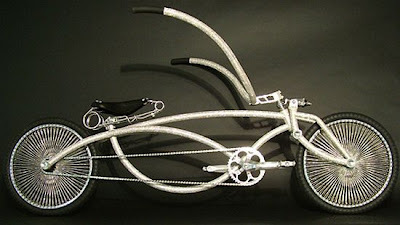 This crystal studded Low-rider bike is hand made to order. We couldn’t get any info about the pricing, but it certainly won’t fit the budget of an average Joe. The Swarovski Crystal Aerospace Car, designed by the Welsh designer, Lovegrove is a concept that will run entirely on solar power. The car features a bubble-type hood and sleek wheel design. Lovegrove’s focus for this design is transport and sustainability; he presents a solar powered hybrid concept car for our future. The synergies between the alternative energy source, the materials and design are immaculate, rendering the obvious style as effortless. 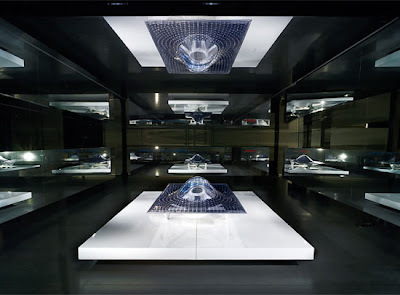 Each of the 1,000 Sharp solar panels has a specially constructed Swarovski crystal embedded in it. 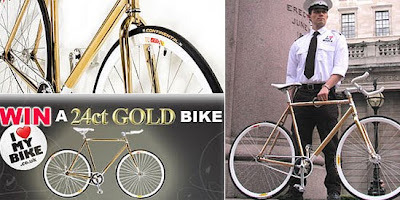 Nothing less then a gold-plated bike for the uber-rich bike-lover with a conscience! A UK based insurance company, ETA, is offering a custom-made 24K gold-plated Charge Plug bicycle complete with customized seat, handlebars and chain to mark the Green Transport Week. The Midas ride comes with its own security guard. This amazing two-wheeled ride is approximately worth $18,750, treehugging sure comes for a price! 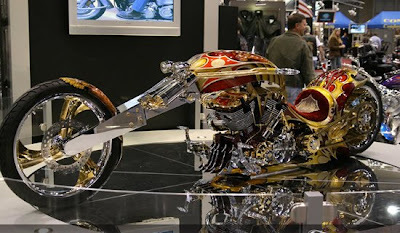 Take a look at this gold-plated custom chopper that is estimated to carry a maddening tag of $500,000! Exhibited at an International Motocycle show in Seattle, this ornamented two- wheeler is more a piece of art than an actual vehicle. If you are wondering that why would some one want to ride it…..then lemme ask, Why not? If you’ve got loads of cash dumped in banks in every corner of the world then who can stop you from splurging. Though I am sure most of the guys aren’t going to jump at the sight of a blinged beast, there may be few of them who would love to ride this Midas touched MV Agusta F4. 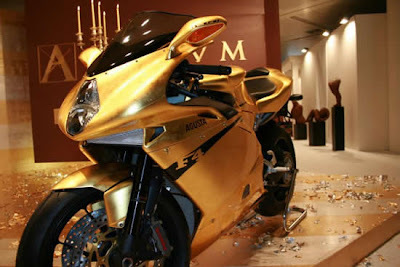 ‘Awesome, gorgeous, breathtaking…’or ‘garish, loud, hooey….’ irrespective of what you uttered the moment you saw this 24 carat gold plated bike, it did blind many of those at International Fair of Luxury where it was unveiled. This blinged version was developed in collaboration with Aurum, a Venetian company that is leader in precious metal processing. With a total surface area of 5 square meters, each 80×80 gold leaf was applied in such a way as to create a flake effect. Driving this gold plated Ford on the road is akin to screaming ” I’m rich, come rob me!” however details about this gilded Ford is a mystery. Not much is known about its opulence too. 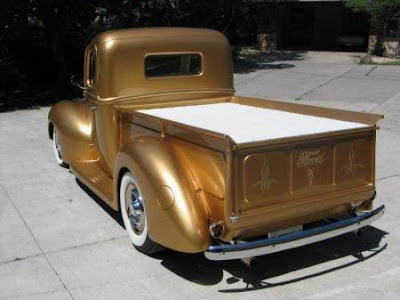 But for sure we know just one thing, that this Ford is gold plated. For those hungry for gold slapped cars, Bucharest Luxury Show 2006 was the place to be. A number of gold plated cars, like this blinged Hummer, from the RealGold company were put on display to treat to dazzle your eyes as well as minds. The company apparently customizes your car as per your needs, so you can pimp your ride, just the way you want! This 1968 Volkswagen Beetle, unveiled at the Luxury Show in Bucharest, Romania, is covered in tiles made of glass and 18-karat gold. Gold-Plated Porsche is designed by Visualis, which earlier presented a Porsche Boxster in 22 carat beaten gold last year, and has now followed-up with the limited edition model, Gold Boxter which will be available in nine gold-plated models. The gold-plated Porsche will feature all the major components, from the control elements such as the steering wheel and doorknobs to the car body and alloy rims in gold-plated version. Though, the price of this Visualis’s gold-chariot still remains undisclosed. But if you have a great fascination for cars with gold and diamond trim than this is really desirable!! Why the heck should we talk about some gold plated handset, MP3 player, or a laptop when we have a gold plated car with us? 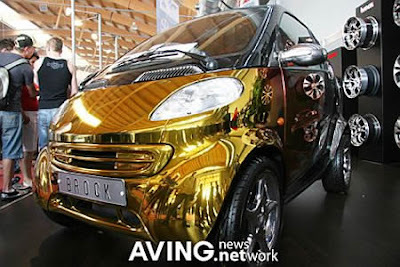 The Midas touched Benz Smart Fortwo was exhibited at Brock Alloy Wheels during Tuning World Bodensee 2007. This customized golden car has been flawlessly designed for your everyday life. The smart golden car offers a blend of comfort, safety, ecology and driving fun, and most significantly, low CO2 emission figures. Is there anyone out here who knows the price figure for this golden car? 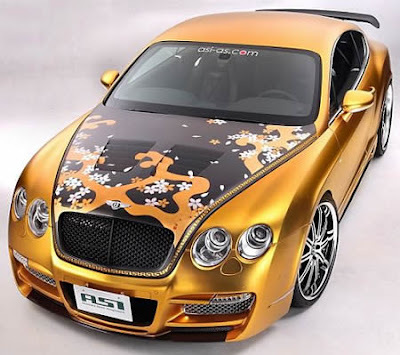 If you think Bentley is a bit less classy to justify your blingy lifestyle then you are in for a surprise with this pimped-out Bentley’s Gold version from ASI, the Japanese tuner specialized in Bentleys. The ASI Bentley Continental GTR Gold features hand painted, original Japanese art by Nakamura Tetsuei. The GT Speed images feature ASI’s standard GT body kit, with the addition of a dry carbon bonnet and trunk + rear wing, and original 3-piece forged wheel. Bentley Gold is by the production 6.0 liter W12 engine that is tuned to deliver 800 hp. Only 29 units will be available for sale for a blinged price tag of $800,000. We have seen the cars studded with diamonds and plated with gold and now, celebrated Folk art master Su Zhongyang has created a stunning ivory carving masterpiece. 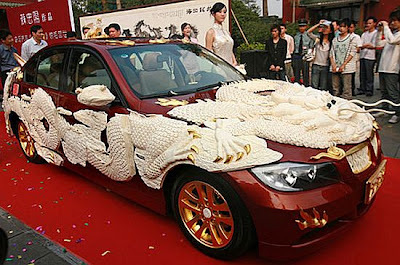 His Jiu Jiu Xiang Long ivory carving car is adorned with 99 fortunate dragons. The car is 4.5 meters long, 1.81 meters wide and 1.9 meters high and weighs 2 tons. Most parts of the ivory car are festooned with colossal ivory and yak bone. If ivory only doesn’t impress you that much, the masterpiece is adorned with gold and diamonds too. The incredible ivory carving car is valued at US $2.7 million. 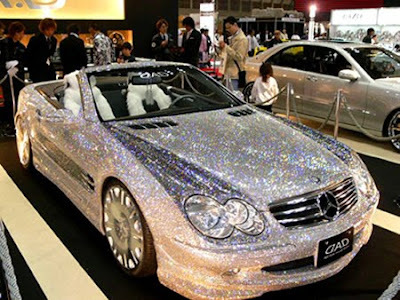 The ultra-shiny, glitzy diamond covered Mercedes SL class was spotted at an auto show overseas. Though, there is no surety, if the diamonds are real, but, it looks really dazzling whatsoever! And if you want to estimate its value then you need to know your mathematics well….that is the place value of zeros beyond billions. The uber-rich just can’t have enough of diamonds and gold and just like they love to dress-up in priceless jewels, so do they want their rides to be as fancy as they are! So, the creators of the Lexani Wheel line have yet again come up with their luxurious wheel line that is studded with diamonds and rubies! 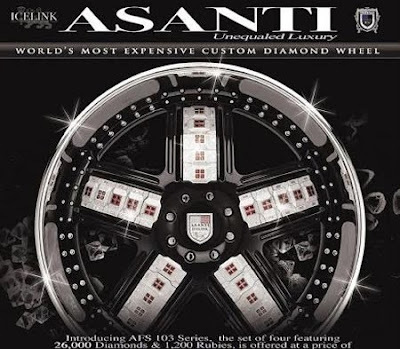 The Asanti ASF 130 Series feature a set of four 34 inches wheels with 26,000 diamonds and 1,200 rubies. And, a set of four costs more then most of the priciest roadsters in the world, for an exceptional $2 million. 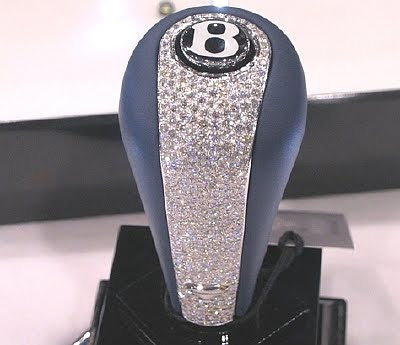 The ever-luxurious Bentley adorns the jeweled look with this $150,000 Bentley Knob! This royal masterpiece is handcrafted with 30 carats of real diamonds and 10 ounces of 18 carat white gold. This world’s most expensive Bentley shift knob almost equals the price tag of the roadster itself, for $150,000 and it took 100 hours of labor to complete. Don’t miss out the 24kt gold plated wheels, engine and also the springs for an understated bling. Bullion Exchanges is a well known Precious Metals Seller located in the heart of New York City's Diamond District. Bullion Exchanges have a wide inventory of products like, bullion that range from the gold and silver to the newly emerging platinum & palladium. They are offering a wide selection of products appealing to 1st time shoppers and established collectors.